With there being a 5th Sunday there isn't a topic or outline to follow for Sharing time. Identify the doctrine: Jesus Christ Is Our Savior. Review with the Primary Children what the word Savior means. Help the Children Understand the Doctrine: Show the movie, "Finding Faith in Christ"
Help them apply the doctrine in their lives: After the movie, have them share their testimonies and thoughts about how the atonement of Christ has personally blessed their lives. 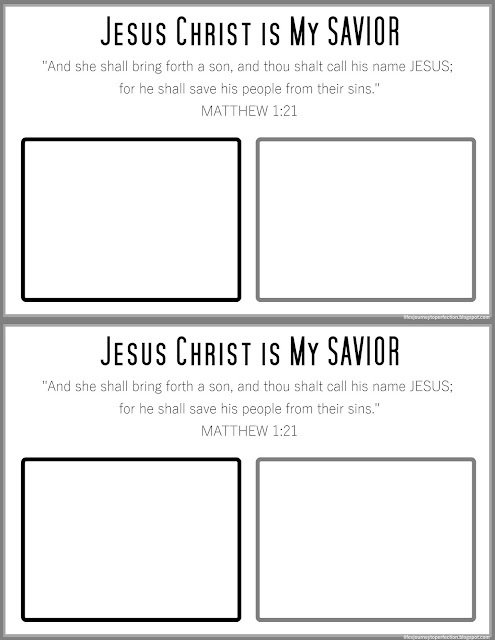 OR using the printable below have the children write or draw pictures about how they can use the atonement in their lives. Begin the sharing time, by asking the children what the word "SAVIOR" means? Explain that a savior is someone who saves or rescues someone from something of danger. Ask the children if they know what Jesus has saved us from? Explain that Jesus Christ has saved us from sin, sorrow, pain and death. Ask the children how he did this? Explain that Jesus, took upon himself all of the pains, sorrow and sins of the world as he suffered in the Garden of Gethsemane. He suffered so intensely that he bled from every pore. Then he was crucified on the cross. He did this because of his great love for each one of us. He knew that it was the only way for us to be rescued from sin, allowing us to seek repentance so we could obtain eternal life. He then overcame physical death, making it possible for each of us to be resurrected someday. It is all a part of our Heavenly Father's plan of happiness and redemption. After the movie allow the children to share their testimonies about how the atonement of Christ has personally blessed their lives. OR using the printable above have the children write or draw pictures about how they can use the atonement in their lives. Bear your testimony about Jesus Christ being our Savior.